.50 Action Express round next to a .32 ACP cartridge. The Arcadia Machine and Tool AMT Automag V was the first handgun chambered for the .50 AE. The actual cartridge has a .547 inch (13.9 mm) diameter base, with a rebated rim. The rim diameter of the .50 AE is the same as the .44 Remington Magnum cartridge. A Mark XIX Desert Eagle in .50 AE can be converted to .44 with nothing more than a barrel and magazine change. The introduction of the .50AE in the US was met with a rocky start. US laws state that non-sporting firearms may not be over 0.500" in bore diameter (measured land to land) to meet Title I regulations. The original .50 Action Express bore diameter was .510" with conventional rifling, but the switch to polygonal rifling on production Desert Eagles allowed the gauge plug to drop through, rendering the gun a destructive device under Bureau of Alcohol, Tobacco, Firearms and Explosives (BATFE) regulations. Nominal bullet diameter was reduced to the current 0.500 inch (12.7 mm) rather than the original .510" – thus the noticeably tapered case. Loaded .50 AE ammunition is currently available from CCI Ammunition, Speer, Hornady, and IMI with the latter ammunition being imported into the US by Magnum Research under the "Samson Ultra" trademark. Fired from a standard six-inch Desert Eagle barrel, Speer's 300-grain load produces a muzzle velocity of over 1,500 ft/s, giving a muzzle energy of over 1,500 ft⋅lb (2,000 J). Fired from a 10-inch barrel, the same load produces a muzzle velocity of over 1,600 ft/s, giving a muzzle energy of nearly 1,800 ft⋅lb (2,400 J). Recoil of the .50 AE in the Desert Eagle pistol is substantial, although only marginally more severe than the .44 Magnum, as the auto mechanism and weight of the gun smooth the recoil somewhat. Other firearms chambered for the .50 AE include the AMT AutoMag V, and the LAR Grizzly Win Mag. SAAMI specifies a maximum chamber pressure of 36,000 psi (248 MPa) for the .50 AE. Available factory loads can produce nearly 1,800 ft·lbf (2440 J) of muzzle energy. New, unprimed brass is available from Starline. Bullets are available from a few different manufacturers. Many of the bullets designed for the .500 S&W Magnum are too long for use in .50 AE semi-automatic pistols. 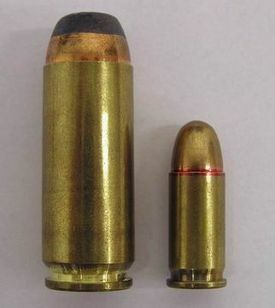 Like other handgun cartridges of such magnitude, the principal uses of the .50 AE are metallic silhouette shooting and medium/big game hunting. Like the .44 Magnum, .454 Casull, .460 S&W Magnum, and .500 S&W Magnum, it is also well suited for defense against large predators, such as bears. The cartridge is the parent case for the .440 Cor-Bon (1998) by Cor-Bon and .429 DE (2018) by Magnum Research (a division of Kahr Firearms Group). Though similar, they are not interchangeable. Desert Eagle magazines chambered for .50 Action Express can feed the derivative cartridges but need to use a barrel bored for 0.429 caliber [10.89-mm] (.44 Magnum). ^ ".50 AE loading data at Accurate Powder" (PDF). Archived from the original (PDF) on 2007-09-28. Retrieved 2007-08-12. ^ "50 American Eagles with 300-grain Gold Dot HP" (PDF). Archived from the original (PDF) on 2011-07-16. Retrieved 2009-11-11. ^ a b c ".50AE Ammunition". Archived from the original on 2010-12-17. Retrieved 2010-12-18. ^ Ordorica, Ray (1996). Handguns /97. DBI Books. p. 179. ISBN 978-0-87349-184-6. ...in brown bear country, a 500 Linebaugh or 50 AE on the hip is a better prescription for potential maladies than anything smaller. Wikimedia Commons has media related to .50 AE. This page was last edited on 21 February 2019, at 10:14 (UTC).